It will be much appreciated if you could click the following banner. At the end of last year, a large number of manufacturers across the nation fired temporary workers even before their work contracts expired. To help those who lost jobs, a civic group set up a tent camp, called Toshikoshi Hakenmura (village for temporary workers to see out the old year), in Tokyo's Hibiya Park. A year later, the country's employment situation has grown even more serious. How effective will the government's emergency employment measures be? The government must do all it can to alleviate the severe employment situation as the year-end approaches. Kitakami, a city located in the southwest of Iwate Prefecture, has some of the leading industrial parks in the country. Blessed with vast plains and abundant water, the city capitalizes on its good location connected to an expressway. With a large number of leading companies having set up plants there, the city until recently enjoyed a reputation as having successful industrial parks where a variety of industries are concentrated. Yet the tide of recession is sweeping toward the city. At Iwate Toshiba Electronics Co., a Toshiba Corp. subsidiary located in an industrial park in the northern part of the city, a vast plot of land lies vacant next to the firm's semiconductor plant. Toshiba announced in 2008 it would build a new plant in Kitakami to produce cutting-edge NAND flash memory products. But the firm decided early this year to postpone construction of the plant due to flagging sales of semiconductors and a serious downturn in business. The site for the planned flash memory plant will soon see its second winter. Under the initial plan, the plant was scheduled to start operation in spring 2010 and employ about 1,000 new workers. About three years ago, the ratio of job offers to job seekers in the city rose to about 1.9 thanks to companies that flooded to the city to open new plants. As a result, the city ran short of workers. But now, the job-offers-to-job-seekers ratio has nosedived to about 0.3. Kitakami Mayor Akira Ito awaits the day when Toshiba decides to start the construction. The mayor has been visiting companies with branches in the city, asking them to hire even one more employee, in what he calls his "plus one" campaign. This situation is not confined in Kitakami, but can be seen across the country. NEC Corp. has closed its liquid crystal panel plant in Izumi, Kagoshima Prefecture, while Honda Motor Co. postponed operation of its new plant in Yoriimachi, Saitama Prefecture. Listed companies' midterm earnings reports for the period ending in September showed that their business performance is improving. But they are still cautious about making capital investments as they strive to cut costs to be globally competitive. The Internal Affairs and Communications Ministry announced Friday that the number of jobless people was 3.44 million in October, while the seasonally adjusted unemployment rate was 5.1 percent. The nation's job-offers-to-job-seekers ratio remains at a low level, at a seasonally adjusted 0.44. Under its slogan of "From concrete to people," the administration of Prime Minister Yukio Hatomaya touts a policy shift that allocates taxpayers' money to programs related to people's lives, rather than to public works programs, as was seen in the past. This policy shift has slashed the number of public works projects, which local economies rely heavily on, dealing a heavy blow to the economies, which were already suffering from the ongoing wave of corporate restructuring. The government, which compiled emergency employment measures in October, has begun studying additional employment measures for inclusion in the second supplementary budget for fiscal 2009. With the number of jobless rising, there are fears of downside risks for the economy, making it vitally important for the government to come up with new bold measures. The pillar of the emergency employment measures is the provision of assistance to those who have lost their jobs and are in poverty and distress, and to new graduates, as well as the creation of jobs, mainly in such areas as nursing care, agriculture, forestry and fisheries, for about 100,000 people by the end of this fiscal year. With the measures, the government aims to make the Hello Work job placement offices one-stop centers that, as well as helping unemployed people find jobs, can also help those who have become homeless as a result of losing their jobs find accommodation. But these measures are nothing new. Meanwhile, to encourage firms to temporarily lay off rather than fire employees, the government will ease requirements for receiving a governmental subsidy to defray costs relating to layoffs. Steps such as these would go some way to protecting jobs. But subsidies like the one for firms furloughing workers should be expanded, while the government should carefully design job-training programs. The ratio of college students graduating next spring who have received unofficial job offers hovered at around just 60 percent as of October, leaving the job situation for job-hunting college students extremely tight. To avoid creating a generation of unemployed people, it is an urgent task to boost such assistance. What is probably important in the mid- and long term is to expand job opportunities. Although the government has set a target of creating 100,000 jobs, that figure is dwarfed by the number of jobless, which has ballooned to 3.44 million. Expanding cooperation among the sectors of agriculture, commerce and industry will reinvigorate these primary industries and boost tourism, the government should mobilize all workable policy steps so as to create more jobs in rural areas. Job-creation measures will also directly lead to measures to prevent the hollowing out of domestic industries. Driven by fierce price-cutting competition for their products at home, more and more companies are shifting their production bases out of the country, further reducing the number of job opportunities. As a result, the Japanese economy is in danger of falling into a vicious cycle in which it becomes increasingly anemic. For such reasons, the government needs to hammer out a new growth strategy that will revitalize domestic industries and regional economies. The promotion of new industries that can capitalize on Japan's strong points, such as those in the area of environmental protection, will generate economic vitality and create jobs. The government needs to present a clear-cut vision to give domestic industries and regional economies hope for the future. In this respect, the key will be to generate demand in other Asian countries for Japanese goods by reinforcing product-development and export strategies targeted at consumer markets in Asia. The United States and China, the world's two largest emitters of greenhouse gas, have recently announced their medium-term targets for CO2 emission reductions. We hope their commitments will add momentum to the drafting of a fair framework to succeed the Kyoto Protocol, which expires at the end of 2012. The United States has set itself a target of cutting greenhouse gas emissions by 17 percent from 2005 levels by 2020. The U.S. targets also include a 30 percent reduction by 2025, 42 percent by 2030 and 83 percent by 2050. However, a 17 percent cut from 2005 levels actually represents a reduction of just a few percent from 1990 levels. This contrasts sharply with the target set by the administration of Prime Minister Yukio Hatoyama, which aims to curb this nation's emissions by 25 percent from 1990 levels. The U.S. targets are very realistic, as restoring the economy is currently Washington's top priority. Meanwhile, China, which has recently surpassed the United States to become the world's largest greenhouse gas emitter, has announced it will reduce carbon dioxide emissions per unit of gross domestic product by 40 percent to 45 percent compared with 2005 levels by 2020. The Chinese target of cutting emissions per unit of GDP is different from those adopted by Japan and the United States, which aim for reductions in total emissions volume. Under this approach, China would be allowed to emit more CO2 if its GDP grows. China is apparently trying to trumpet to the world its contribution to tackling greenhouse gas reduction without damaging its economic growth. It also has stressed that cutting greenhouse gas emissions is a "voluntary action based on our own national situation." This indicates that Beijing is wary of entering into internationally binding deals on emissions reductions. The 15th Conference of the Parties to the U.N. Climate Change Convention (COP15) will start in Copenhagen on Dec. 7. The U.S. and Chinese announcements of midterm targets is undoubtedly one step forward in the lead-up to COP15 discussions that will focus on a post-Kyoto Protocol international framework to be followed from 2013. In reality, however, there is still a gulf of opinion between major industrialized countries and developing countries on how to tackle climate change. It already appears almost impossible for a post-Kyoto Protocol framework to be adopted in the Danish capital in December. The focus of attention has already shifted to whether the COP15 nations can reach a major political agreement that could lead to the adoption of a new protocol next year. Moves by the United States and China hold the key to the success of the talks. There is concern that some developing countries are leaning toward a possible extension of the Kyoto Protocol beyond 2012. The Kyoto Protocol lacks teeth as the United States has withdrawn from it and China, as a developing country, is not obliged to cut its emissions under the pact. Hatoyama has made an international pledge to reduce greenhouse gas emissions by 25 percent without seeking the backing of the Japanese public. As a precondition for committing the nation to this target, however, he has stated that all major nations must sign on to a post-Kyoto Protocol framework. Japan must steadfastly maintain this condition at the upcoming COP15 talks. The Government Revitalization Unit on Friday ended its nine-day budget screening session to identify wasteful spending in fiscal 2010 budget requests for government-led projects. The unit judged that many of the 449 projects it examined should be abolished or downsized. The task force also demanded that some funds already distributed to independent administrative organizations and public-interest corporations be returned to the national coffers. The money to be returned and savings raked in from the abolished projects outlined in the initial budget requests will top 1.6 trillion yen. Although this is still short of the government's target of 3 trillion yen, the savings could be used as a precious financial resource for next fiscal year's budget. However, the first attempt to broadcast part of the government's budget drafting process live on the Internet created many problems. Some members of the unit's screening teams, comprised of lawmakers and experts from the private sector, basked in the public exposure and often played to the gallery, snapping at officials from the government organizations to give them explanations on the projects. It was appalling behavior. The criteria by which budget examiners were chosen from the private sector also remain unclear. Prime Minister Yukio Hatoyama said he plans to continue the budget screening in and after fiscal 2010. If so, we think it is necessary to revise the rules for running the session--such as by giving sufficient opportunities for budget briefers to answer questions and clarifying the standards by which budget examiners from the private sector are selected. Many questions also have been raised about why some government projects were subject to the screening when it was obvious they could not be discussed properly in just one hour. Projects that fell under this category included allocations for the so-called sympathy budget for U.S. military forces in Japan, the Foreign Ministry's support of international institutions and funding to promote science and technology. These matters are all closely related to what the nation should be and its future. They cannot be solved so easily. Perhaps the biggest controversy during the screening was the panel's decision to effectively freeze the budget for a next-generation supercomputer project. Nobel laureates and business leaders have poured scorn on this decision, saying that short-term cost-effectiveness was not the proper standard for evaluating science and technology projects. They also warned that Japan could eventually lose the global race to develop advanced technology. We wholeheartedly agree with them. The unit might have lacked the strategic thinking needed to deduce what fields should be given priority in budget allocations from long-term and international points of view. It was also regrettable that the unit decided to abolish a project to encourage children to read books. Ill-advised judgments made by the panel this time around must be corrected in the future. The decisions made during the budget screening session are not final. The government could treat them as a set of criteria for making decisions on the budget, but it should not be bound by them. The responsibility for deciding how to treat the unit's judgments in the budget drafting process now rests in the hands of this nation's lawmakers. The yen's value has surged as selling pressure on the U.S. dollar has accelerated on foreign exchange markets. This situation could deal a devastating blow to the tottering Japanese economy. The yen jumped to a 14-year high in the 86 yen level against the dollar Thursday in Tokyo. The dollar seems to be declining across the board against the euro and currencies of newly emerging economies. Finance Minister Hirohisa Fujii indicated the government would intervene in the currency market if exchange rates "move abnormally." U.S. Federal Reserve Board Chairman Ben Bernanke also warned against sharp falls of the dollar when he stated recently that the Fed would monitor changes in the value of the greenback. As dollar-selling pressure appears unlikely to ease anytime soon, the appreciation of the yen and depreciation of the dollar likely will continue for some time. Monetary authorities in Japan and the United States, and other countries for that matter, must work together to moderate excessive fluctuations in currency markets by exploring the possibility of market interventions. The biggest cause of the falling dollar is the expectation that the United States' ultralow interest rate policy will remain in place as the U.S. economy continues to sputter. The U.S. unemployment rate has risen to 10 percent. Nascent indications are that this could be a jobless recovery. Some observers have even suggested that U.S. authorities are tacitly tolerating moderate falls in the dollar to stimulate the economy through growth in exports. A more worrying problem is that the so-called dollar carry trade--investors selling dollars with relatively low interest rates and instead investing in higher-yielding currencies--has kicked into gear. The yen carry trade was commonplace from about 2004 through 2007. This time around, the dollar is shaking up money markets around the world. The price of gold has surged to a record high near 1,200 dollars an ounce in New York. This also is a sign that investors are discarding the greenback because gold is purchased as an alternative currency to the dollar. Crude oil and grain prices also have been creeping up as investment funds are diverted into these markets. A sharp rise in the value of the yen and a plunge in the value of the dollar could spell disaster for the Japanese economy, which remains mired in deflation and has yet to get on the path to a full recovery. Many exporting companies had assumed the yen would average about 90 yen per dollar throughout the second half of this fiscal year. If the yen continues to appreciate sharply against the dollar, these companies would take a battering. These exporters are a driving force of the nation's economy; any faltering by them could throttle the economy again. Furthermore, the euro's surge could stall a full recovery of the European economy. Concern about economic bubbles is rising in newly emerging nations such as Brazil, which have been magnets for investment funds. A fall in the dollar would throw the world economy into confusion. To ensure this does not come about, it is essential that the United States emerge from a jobless recovery and regain confidence in its currency. To this end, we consider it imperative that the United States implement effective measures to boost employment. A full investigation into alleged secret pacts involving the entry into Japan of U.S. nuclear weapons--among other issues said to have been agreed between Tokyo and Washington--is essential to recover public trust in this nation's diplomacy. However, the probe must not be allowed to weaken the effect of the U.S. forces' nuclear deterrence. A panel of experts set up by the Foreign Ministry to investigate the alleged pacts will hold its first meeting Friday. Based on the results of an in-house Foreign Ministry investigation, the panel members will interview retired ministry officials before submitting a report to Foreign Minister Katsuya Okada in January. The panel will examine four alleged secret pacts, including one said to have been inked in 1960 when the Japan-U.S. Security Treaty was revised. This agreement reportedly effectively allowed U.S. military ships and airplanes carrying nuclear arms to visit or pass through Japan without prior consultation between the two governments. Disclosed U.S. diplomatic documents and the testimony of a former administrative vice-minister for foreign affairs have already undermined the credibility of the former government's official denial of the existence of the pacts. Furthermore, the ministry's latest probe unearthed a document supporting the pacts' existence. It is highly significant that Okada is launching his own inquiry after the Democratic Party of Japan wrested power from the Liberal Democratic Party and he was made foreign minister. If the DPJ-led government was to officially admit the existence of the secret pacts based on the results of the inquiry, it would be the first step to dispelling the sense of mistrust felt by the public. However, we can understand the circumstances under which the government at that time deemed it necessary to draw up a secret deal with the United States to secure the effectiveness of the U.S. "nuclear umbrella," while consideration likely was paid to the antipathy of Japanese people toward nuclear arms during the Cold War period. We expect the panel members to take into account the historical background of the period and try to discern how such pacts might have been thrashed out. Secrets are an inherent part of diplomatic negotiations. During such bargaining, there is much information that cannot immediately be disclosed in terms of maintaining relations of trust with a partner country and preventing harm to the people concerned. However, it is important to deepen discussions on the kind of circumstances in which it is appropriate to disclose such information after a certain period of time. Hereafter, discussions must be held to review the three nonnuclear principles of not producing, not possessing and not allowing the entry of nuclear arms into this country. Japan's present security situation is becoming increasingly unstable in light of North Korea's declared possession of nuclear weapons, for example. This makes it necessary to maintain and even improve the U.S. forces' nuclear deterrence. In 1991, the United States removed tactical nuclear weapons from its military ships and nuclear submarines. This made the entry of nuclear weapons into Japan unlikely, at least for a while. But in the medium-to-long term, there is no guarantee that a neighboring country will not threaten the security of this nation with nuclear, biological or chemical weapons. A founding principle of national security is that a country must remain militarily flexible to deal with changing situations. We believe it may be time for the government to seriously consider introducing "2-1/2 nonnuclear principles," which would still prohibit the deployment of nuclear arms on the ground but would allow ships and airplanes carrying nuclear weapons to visit Japan. A land reclamation project in Okinawa Prefecture is highlighting afresh the old issue of public works projects that are kept alive when there is no longer a strong need for continuing them. Last month, the Naha branch of the Fukuoka High Court ordered the suspension of public spending for a land development project to reclaim the Awase tidal mudflats in the city of Okinawa on the central-eastern part of the main Okinawa island. But Okinawa Mayor Mitsuko Tomon intends to continue the landfill project by crafting a new plan for the use of the land by the end of the current fiscal year. The prefectural government supports the city's response to the ruling. The Awase mudflats are among the largest coastal wetlands in Japan's southwestern islands and known as a habitat for more than 100 rare species. The project would reclaim 187 hectares including the tidal flats to create an artificial island for the building of hotels and other resort facilities. The reclamation work would be carried out by the central and prefectural governments at a cost of about 48.9 billion yen, and the beach development part of the project would require the prefectural and municipal governments to spend 30 billion yen. The plaintiffs sought a court injunction to stop the project, claiming it is damaging to the environment and questionable from an economic viewpoint. The high court ruled that promoting the project while its economic benefits are unclear would be illegal. The ruling basically supported the decision by the Naha District Court in November last year. While the district court ordered the suspension of all public spending for the project, the high court ruled that spending to cover research and personnel costs necessary for reviewing the plan and changing the license to reclaim land would be legal. This judgment is behind Tomon's decision to redraw the development plan and not appeal the high court's ruling. But does Tomon's refusal to withdraw from the project respect the spirit of the rulings, which both denied that the plan makes good economic sense? Indeed, the high court decision has left open the possibility of continuing the project. But the court set a tough condition for doing so, saying the economic benefits of the new plan need to be confirmed through "a considerably robust assessment." Such an assessment must be made before any decision to continue the project. A rigorous reassessment from scratch on the economic benefits of the project is also needed to determine if it is really necessary. Land minister Seiji Maehara, who is in charge of Okinawa-related affairs, has called off this fiscal year's bidding for the project under the original plan and suspended the reclamation work. We hope he will take an equally uncompromising stance toward the new land use plan. The law regulating such landfill works doesn't assume that a project can be aborted. This legal hole has been brought to the fore by the dispute over the Awase project. The mammoth project to desalinate Shinjiko and Nakaumi--two brackish lakes with more salinity than fresh water but not as much as seawater straddling Shimane and Tottori prefectures--was frozen in 1988. But it took the government many years to scrap the project. The law on which the desalination project was based contained no rules for putting a project on hold. A 2001 revision to the law finally established the formal procedure for scrapping projects. There are also no legal procedures for aborting public works projects to build roads and dams. Discontinuing public works projects usually requires settlements of the money provided by the central and prefectural governments as well as compensation for local communities affected. Given the dire fiscal situation and dubious economic benefits of public works projects, the era of extravagant spending on public investments is undoubtedly over. It is urgent to create rules for pulling the plug on public works projects. Charles Darwin's seminal work "On the Origin of Species" revolutionized not only biology but also people's perception of the human race. It was first published on Nov. 24, 1859, exactly 150 years ago. This year also marks the bicentennial of Darwin's birth. Abraham Lincoln, the 16th president of the United States, also shares the same birthday--Feb. 12, 1809. Like Darwin, Lincoln changed history. With a rash of publications and events to commemorate the anniversary of Darwin's landmark theory, it behooves us to think anew about the human species from an evolutionary aspect. From the time Darwin conceived the notion of evolution during his voyage on the Beagle, it took him more than 20 years to mull over his ideas and finally put them down in book form. One of the reasons it took so long was that Darwin anticipated strong resistance from society, especially the church. In fact, it was not until 1996 that the late Pope John Paul II finally acknowledged the theory of evolution as "more than just a hypothesis." All species evolve and branch out. The validity of Darwin's theory is also borne out by a finding that humans are close to chimpanzees. Their genetic differences amount to only 1.2 percent. Humans are not so special after all. What Darwin called "dizzying diversity of life" is a product of evolution and cataclysmic changes in the Earth's environment. But with humans now ruining that diversity, it has become more important than ever to understand where humans belong in the evolutionary chain. In the United States, many people still believe in creationism and vehemently object to the theory of evolution being taught in schools. We can only hope that the Obama administration's respect for science will steer the United States into a society that is more accepting of Darwinism. Japan has contributed significantly to the advancement of the theory of evolution. As a key mechanism of evolution, Darwin proposed that the process of natural selection produces mutations favorable to the survival and propagation of species. In 1968, however, the Japanese biologist Motoo Kimura (1924-1994) introduced the theory of neutrality of molecular evolution. Kimura argued that about 80 percent of sudden changes in protein and other substances are neither beneficial nor harmful, and that whether the mutants survive is accidental. Kimura's theory was met with considerable opposition at first, but has since come to be accepted as one of the two pillars to support Darwin's theory of evolution along with natural selection. According to Mariko Hasegawa, a professor of anthropology at the Graduate University for Advanced Studies, living creatures possess numerous mutant factors, some of which kick in when the environment has changed. For instance, there are Antarctic fish whose blood does not freeze. It appears that their mutant factor helped when they were migrating and found themselves in sub-zero waters. Humans, on the other hand, have caused their environment to change considerably over the last 10,000 years. Today's children are growing up quite differently from their peers in the past. Of the five senses, only the visual sense is inundated with information. The other senses tend to remain less developed. How will humans change in the environment of their own making? The future of the human race is something to think about. MANILA, Philippines (AP) -- Philippine President Gloria Macapagal Arroyo placed two southern provinces under a state of emergency Tuesday, giving security forces free hands to pursue gunmen who killed at least 24 people in one of the country's worst election massacres. The emergency measures, including checkpoints and random searches by authorities, will remain in place until the president is confident that law and order have been restored in the region, Arroyo spokesman Cerge Remonde said. The attack Monday was on a convoy of vehicles filled with supporters of a gubernatorial candidate along with his relatives, including his wife, and several journalists. The candidate, Ismael Mangudadatu, who was not a part of the convoy, accused his powerful political rival of being behind the slayings. The government stressed that it would go after the culprits, regardless of where the investigation leads. "No one will be untouchable," Remonde told reporters, calling Monday's killings "unconscionable." Officials were still trying to determine the exact number of people intercepted by about 100 gunmen and taken to a remote mountainous area, said Interior Secretary Ronaldo Puno. "We're hopeful that some people escaped, and we're hoping to find them alive," he said. Police said the convoy of about 40 people was going to register Mangudadatu, vice mayor of Buluan township, to run for provincial governor when they were stopped. Soldiers and police later found 24 bodies, including those of Mangudadatu's wife, Genalyn, and his two sisters, sprawled on the ground or shot in their vehicles about five kilometers from where they were ambushed, police spokesman Leonardo Espina said. Mangudadatu said Tuesday that four witnesses had told him the caravan was stopped by gunmen loyal to Andal Ampatuan Jr., a town mayor belonging to a powerful clan and his family's fierce political rival. He refused to name the witnesses or offer other details. "It was really planned because they had already dug a huge hole (for the bodies)," Mangudadatu said. The National Union of Journalists of the Philippines said at least 10 local reporters were part of the convoy. Espina said they identified the remains of at least one journalist. Joy Sonza, head of a small private TV station, UNTV, said investigators told him they found the bodies of his correspondent and cameraman. A driver and an assistant cameraman were still missing, Sonza said. If confirmed, it would be the "largest single massacre of journalists ever," according to Paris-based Reporters Without Borders. The army and police were searching for as many as 16 other people who were missing, military spokesman Lt. Col. Romeo Brawner said, adding that troops were looking for more bodies in areas that appeared to have been recently dug up. A backhoe was apparently used to bury the bodies, said army commander Lt. Col. Rolando Nerona. Puno vowed there would be no sacred cows in the investigation. "Within day or two, we should be starting to call people or making arests. We have some information already about specific names but we can't disclose them," he said. National police chief Jesus Verzosa relieved Maguindanao's provincial police chief and three other officers of their duties and confined them to camp while being investigated. One of the police officers was reported to have been seen in the company of the gunmen and pro-government militiamen who stopped the convoy, police said. The Ampatuans were unreachable for comment. The region, among the nation's poorest and awash with weapons, has been intermittently ruled by the Ampatuan family since 2001. It is allied with Arroyo. Arroyo's political adviser Gabriel Claudio said he was meeting with Zaldy Ampatuan, governor of the Automous Region in Muslim Mindanao, when the killings occurred Monday to try to mediate in the long-running rivalrly between the the Ampatuans and the Mangudadatus. "I really thought that at the time that the affinity, the relations between the two families, will be affirmed," he said. He said the most important thing was to ensure there was no more violence. "There has to be swift and decisive justice," Claudio said. Philippine elections are particularly violent in the south because of the presence of armed groups, including Muslim rebels fighting for self-rule in the predominantly Roman Catholic nation, and political warlords who maintain private armies. The last elections in 2007 were considered peaceful, even though about 130 people were killed. The decades-long Muslim insurgency has killed about 120,000 people since the 1970s. But a presidential adviser, Jesus Dureza, said Monday's massacre was "unequaled in recent history." Julkipli Wadi, a professor of Islamic studies at the University of the Philippines, said he doubted the national government's resolve in trimming the powers of political dynasties like the Ampatuans because they deliver votes during elections. "Because of the absence of viable political institutions, powerful men are taking over," he said. "Big political forces and personalities in the national government are sustaining the warlords, especially during election time, because they rely on big families for their votes." White House says it will come "within days." Some say Dec. 1, but officials insist nothing has been decided. Key officials are preparing to testify before Congress. About 23 percent of homeowners owe more on their mortgages than what their house is worth, which could slow a housing recovery. The prime minister threw cold water on speculation by cautioning that no agreement has been reached yet, but there are growing reports of progress in negotiations that would release Staff Sgt. Gilad Shalit, who was captured and taken to Gaza in 2006. Why Has Obama Abandoned Basketball for Golf? He's not very good at it but has played more than his predecessor since taking office. Some think it's about time he dropped the clubs and got back on the court. Two southern provinces were put under emergency rule as more bodies were found in a shallow grave. Might be the world's worst mass-killing of journalists. When federal officials unsealed terrorism-related charges against eight men yesterday, they revealed how 20 young Somali Americans from Minnesota were recruited to fight in a Somali militia. The Federal Reserve asked nine U.S. banks to outline how they plan to repay the government. In an attempt to counter the opposition that grew out of last summer's presidential election, the government has launched a "soft war," an ambitious effort to get its message out to the general public, including children. After taking criticism from the international community, the White House announced it would go to the climate talks next month with a proposed target for reducing greenhouse gas emissions. Men who refuse to speak up about frustrations at work are much more likely to suffer a heart attack. The trustee hired to recover assets for the Ponzi schemer's victims asks for $22.1 million for five months of his law firm's time. A USC professor has spent four years developing a 1,000-word alien dialect for James Cameron's much-anticipated 3-D epic. In the House of Representatives election on Aug. 30 this year, a 21-year-old South Korean man in Japan born to a Japanese mother and South Korean father exercised his right to vote for the first time. A revision to the Nationality Law in 1984 permitted children born from 1985 onwards to hold dual nationality up until the age of 22 if one of their parents was Japanese. Still, the existence of people such as the 21-year-old, who has both dual nationality and the right to vote, is not widely known in Japan. Next year, the 21-year-old, who must choose between the two nationalities, plans to follow the path of his brother, who is two years his elder, and select Japanese citizenship. "I didn't know my Korean name until my third year of elementary school, and I can't speak Korean even now. I was teased about my Korean name in the past, and I have lots of Korean friends living in Japan, but my awareness as a Korean is, frankly speaking, low," he says. In the Lower House election, the 21-year-old voted for the Democratic Party of Japan (DPJ), which has pushed for local-election voting rights for long-term foreign residents. He attended several meetings with South Koreans in Japan, and though he was unsympathetic with their call to be given suffrage in exchange for their obligation to pay taxes, he voted for the DPJ as he wanted his friends to be given the right to vote. "The opponents (of voting rights for foreigners) say that Koreans living in Japan will cast anti-Japanese votes, but I don't think so. If they are given voting rights, then voting from the perspective of being a South Korean in Japan will cease. They will vote while thinking about how they can improve their lives," the 21-year-old said. There are about 910,000 foreigners in Japan who hold permanent residence, comprising some 420,000 special permanent residents from the former colonized Korean Peninsula and Taiwan, and 490,000 who have met special requirements such as residing in Japan for 10 years or more. It is estimated that there are 470,000 Koreans with permanent residence, more than half of the total. A proposal made by the DPJ's federation of legislators in May last year suggested introducing voting rights only for residents from countries with which Japan has diplomatic relations, thereby excluding North Koreans. If the proposal materializes, then most of the foreign voters will be South Koreans, Chinese and Brazilians, who make up a large percentage of the foreign permanent residents in Japan. Prime Minister Yukio Hatoyama, DPJ Secretary-General Ichiro Ozawa and other party officials have pushed to give permanent foreign residents local voting rights, from both a historical perspective and the perspective of "fraternal" politics that the DPJ has promoted. Ozawa has called for the early submission of a bill to change the law, but the government's priorities remain unclear. The move was incorporated in the party's list of policies and its election promises, but was left out of its election manifesto. Tomomi Inada, a Liberal Democratic Party legislator who opposes giving foreign permanent residents voting rights, argues, "If local assembly members and heads supported by foreigners appear, then it will influence local Diet members. It will constrain Japan's national interests." This line of thinking is also deeply rooted in the DPJ. Fears have been raised that if suffrage is granted in areas such as Osaka's Ikuno Ward, where foreigners account for 24 percent of the population, then it will lead to friction between supporters and opponents. This gives rise to the argument, "Japanese nationals should decide on the future of Japan -- permanent foreign residents can gain suffrage by obtaining Japanese citizenship." At the same time, Katsuhiko Okazaki, a graduate professor at Aichi Gakuin University, who supports voting rights for foreign permanent residents, points out, "There are South Koreans living in Japan who obtain Japanese citizenship to get all the rights, but there is still resistance to losing their South Korean nationality. If dual citizenship were granted, the problem would be solved all at once." Okazaki says that the principles of lineage and exclusivism are deeply rooted in Japan, but the fact that there are already cases of dual citizenship, as is the case with South Koreans in Japan who have voting rights, shows that the concept of what constitutes a national has diversified. He adds that there have been changes in the sense of belonging that is associated with nationality. Next year marks 100 years since Japan's annexation of the Korean Peninsula. It is certain the issue of suffrage for foreigners will emerge as a major point of discussion. Prime Minister Yukio Hatoyama and Democratic Party of Japan Secretary-General Ichiro Ozawa both support giving permanent foreign residents the right to vote in elections that choose local government chiefs and assembly members. The bill is due to be submitted to the ordinary Diet session next year. Since 1998, the DPJ, New Komeito and other parties had submitted similar bills. However, due to deep-rooted opposition, Diet debate over this issue has made little progress. Meanwhile, local communities are becoming increasingly multicultural. The Hatoyama government advocates the creation of a "society where multiple cultures coexist." Then surely it is time to move forward to realize such a society. The number of non-Japanese with permanent residency in the nation has increased by 50 percent in the past decade to 910,000. Among them, 420,000 are ethnic Koreans with special permanent residence status due to their historical background. The figure has increased because a growing number of foreigners have obtained ordinary permanent residence status. Many decided to live in Japan in and after the 1980s for such reasons as business and marriage. They are from various countries, including China, Brazil and the Philippines. Those permanent residents have put down roots as good neighbors in their communities. It is appropriate that they should be given the right to participate in local elections and share the responsibility for improving their communities. The nation needs human resources from abroad to maintain vitality in society. Granting the right to vote in local elections to permanent foreign residents will help to create an environment comfortable for foreigners to live in. It will also strengthen local autonomy in line with the trend for decentralization. Some opponents insist that foreign residents should acquire Japanese nationality if they want to vote. But it is only natural for them to wish to maintain connections with their native countries while having affectionate ties with the communities they currently live in. The answer is not to exclude those people but to create a society that honors diverse lifestyles. More than 200 local governments have come up with ordinances that enable foreign residents to vote in local referendums on issues like municipal mergers. In 1995, the Supreme Court ruled that the Constitution does not forbid new legislation to grant voting rights in local elections to non-Japanese residents with close interests in their communities. More than 40 countries, such as European nations and South Korea, have given suffrage to foreign residents who meet certain requirements and conditions. In recent years, opponents have increasingly expressed concerns that a large number of foreigners could use their voting rights for purposes that might put national security at risk. We cannot accept such inflammatory arguments that seek to agitate, cause anxiety and stir up exclusive intolerance. It is far more dangerous to isolate and exclude foreign residents as "those who might cause harm." We should include them into the community to create a stable society. The DPJ is considering a bill that would limit voting rights to people from countries that have diplomatic relations with Japan. The ruling party is apparently trying to allay anti-North Korean sentiment by excluding ethnic Koreans registered under Joseon (old undivided Korea) nationality, instead of South Korea. However, all people with Joseon nationality do not necessarily support North Korea. We are now trying to create an inclusive system to allow foreign residents to participate as good neighbors in local communities. Is it really appropriate to exclude a certain group of people based on different political concerns? Further debate is necessary. The mountainous Irokawa district in Nachi-Katsuura, Wakayama Prefecture, is in the southeastern part of the Kii Peninsula. It is made up of nine secluded settlements that depend mainly on farming and forestry activities. Nearly 40 percent of the 430 or so residents used to be city dwellers. Kazuo Hara, who heads a regional development committee comprising the heads of the settlements, moved from Hyogo Prefecture at age 26. That was 28 years ago. In 2007, the committee started an education program to train young people outside Nachi-Katsuura to become farmers. Last year, the panel started compiling a written record on life in the region. The committee members are learning the ins and outs from local residents of farm work and how to create traditional food dishes. They are also collecting information about local events and customs over the years. The information is being compiled into a booklet. Migration to Irokawa started more than three decades ago after the local community accepted five families that wanted to try their hands at organic farming. Initially, most of the new residents were would-be farmers sharing the same ideals. Over time, however, different types, like retirees wanting to spend their twilight years in the country and families with young children, have moved to the Irokawa district. The influx of newcomers has helped preserve this area's traditional way of life. But the future of the community is under threat due to the rapid aging of society and the dwindling birthrates. The average age of the original Irokawa residents is 69, and that of newcomers is 40. The settlements will eventually disappear unless young people plant roots there. A sense of crisis prompted Irokawa to try to attract more young people to the area. "We need young people willing to live here as committed members of the community, instead of simple support from the outside," says Hara. He regards one program adopted by another town in the prefecture as ideal for luring young people. Koya, located at the northern tip of the Kii Peninsula, has introduced a program to hire outsiders to help promote regional development. In May, the town government solicited applications for three positions, offering a monthly wage of 150,000 yen for 100 flexible working hours a month under a three-year contract. The town received 162 applications--many more than it expected. Five new recruits in their 20s up to 40s have moved from Tokyo, Kagoshima and elsewhere to live in settlements in Koya. They are trying to find ways to tackle various challenges, for example, by creating a system to support old people and developing new local specialties. The program is the brainchild of Kanji Takahashi, Koya's deputy mayor. "We hope they will find solutions to these challenges and continue living in the settlements after their three years are up," Takahashi says. According to a survey by the central government, about 2,600 of the roughly 62,000 settlements in cities, towns and villages nationwide are in danger of disappearing. On the other hand, there are many city dwellers who want to leave the hurlyburly of city life if they can. These are people who want to raise their children close to nature and seek a spiritually rich life--even at the expense of having less money to live on. Others simply want to spend their retirement years in a rural, laid-back environment. Local communities and governments need to figure out how to attract such urbanites to their areas. Outsiders who are willing to support local development are more important for the survival of local communities than state subsidies. The wisdom and stimulus provided by outsiders can generate energy to move communities from within. Thus, outsiders could be entrusted with the role of planners for regional development. Efforts similar to those described above are being made in many parts of the nation. The administration of Prime Minister Yukio Hatoyama, which has pledged to promote decentralization, should pay more attention to these developments. extramarital affair with a woman he later called his "soul mate." Though Prime Minister Yukio Hatoyama has promised the international community that Japan will boost its assistance to developing countries, the government has cut its support for international organizations that play key roles in aid projects. This is contradictory and unacceptable. The amount of Japan's contributions to international organizations has been decreasing every year since the administration of former Prime Minister Junichiro Koizumi moved to reduce official development assistance as part of its structural reform program that recognized no "sacred cows." The contributions have fallen by more than 40 percent from the peak year of fiscal 2001. Against this background, Hatoyama, in a speech at the U.N. General Assembly in September, vowed to double Japan's efforts to assist developing countries, in close cooperation with international organizations, raising expectations among those organizations for an increase in the amount of Japan's contributions to them. But the actual amount of contributions, measured in terms of budget requests for fiscal 2010, already has fallen below that of fiscal 2009. In addition, some of the contributions have become a target of the budget scrutiny aimed at cutting wasteful spending in ministries' fiscal 2010 budget requests that is being conducted by the Government Revitalization Unit. International organizations targeted in the government's panel's budget screening include the U.N. Development Program, the U.N. Human Settlements Program (UN-HABITAT) and the U.N. Volunteers--hardworking organizations that dispatch staff to Afghanistan and other countries. The government has pledged up to 5 billion dollars (about 450 billion yen) in aid to Afghanistan for nonmilitary purposes over a five-year period beginning this year. The aid is intended to provide vocational training for former Taliban soldiers and promote agricultural development and other worthy goals. But it will not be easy for Japanese people to work in Afghanistan under the aid programs unless the security situation there improves. Japan's aid programs, therefore, will probably be carried out in the form of providing funds to the UNDP and other international organizations and having them dispatch their staff and volunteers to Afghanistan. The government likely intends to secure a budget for funds to have international bodies carry out Japan's aid programs, separately from its contributions. Considering the current situation, in which Japan has no choice but to rely on international bodies to execute its aid programs, it does not make sense to slash contributions to international organizations, which are mainly used to defray their operating costs. Japan has seen its reputation as a major contributor to international organizations dwindle. Some observers have linked the reduction in the amount of Japan's contributions to the dearth of Japanese executive staff in international organizations and their absence on such organizations' boards. The budgets for international organizations, meanwhile, have ballooned. It is important for this country, as a contributor, to urge the organizations to keep a ceiling on their swelling budgets. Japan also should increase its efforts to increase the number of Japanese staff in international bodies. It goes without saying that Japan must pursue these two goals as well as contribute funds to international organizations. But we fear that cutting such contributions willy-nilly could lower Japan's profile in the international community. We do not want to see a situation in which the government attaches so much importance to budget screening to cut wasteful spending that Japan's diplomacy ends up being harmed. The Hatoyama administration is in agony over the relocation of the U.S. Marine Corps Air Station Futenma in Okinawa Prefecture. In the United States, the Obama administration contends the only realistic solution would be to move the base to Henoko in Nago, Okinawa Prefecture, as agreed by the the Liberal Democratic Party-led government and the United States three years ago. But many of the people in Okinawa are against creation of another lasting U.S. military facility in their prefecture, where 75 percent of all U.S. bases in Japan are located. The Okinawa people's hopes will be dashed if their plight does not change even after a change of government. A way to resolve the dilemma involving two points must be found--the importance of the U.S. bases, which are the centerpiece of the Japan-U.S. security alliance, and the fact that throughout the postwar period, Okinawa has almost singlehandedly born the burden of the security arrangements. That seems to be the public sentiment seen in a recent Asahi Shimbun poll that found a majority of the people polled support a review of the existing Japan-U.S. agreement. The matter, therefore, is all the more difficult. It is commendable that in their meeting, Prime Minister Yukio Hatoyama was straightforward with U.S. President Barack Obama and told him how difficult the situation was, and attempted to seek a solution. A review of the existing agreement should begin immediately. However, the basic trust underlying the alliance should not be sacrificed in the process because the Japan-U.S. alliance is the supporting pillar of Japan's security. In this regard, we cannot help but question the behavior of the prime minister and his Cabinet ministers over the past few weeks. The two nations should seek to resolve the issue by the end of the year. As Foreign Minister Katsuya Okada said, the Japanese government needs to decide whether or not to include the relocation costs in the next fiscal year's budget. The government must not act as if it were going to base its decision on the outcome of the Nago mayoral election due next January. Yet, although the prime minister said in his meeting with Obama that he intends to resolve the problem "as soon as possible," the following day, he said he would not necessarily rush a decision within the year. Moreover, it became apparent that his intentions regarding the status of the minister-level working group for reviewing the current agreement were different from what Obama had in mind. It is not just the United States that has been bewildered by the mixed message from the Japanese government. Defense Minister Toshimi Kitazawa said he was considering a breakthrough plan based on the existing agreement, and yet Okada said he was looking for ways to merge the functions of Futenma with Okinawa's Kadena Air Base. In addition, the prime minister does not deny the possibility of moving Futenma air base outside of Okinawa, saying he himself intends to put together the final plan. There is no way the Okinawa people, together with the rest of the country, can fathom which way the government is looking. The Japan-U.S. agreement is a multi-faceted package of interlinked changes that include reorganizing and streamlining the U.S. bases in Japan, transferring U.S. Marines from Japan to Guam, and the Japanese government paying much of the costs of that transfer. What is important is for the prime minister to state clearly that he has no intention of changing this framework itself. If, on top of that, he intends to look for a transfer location other than Henoko, then he must propose that clearly to the U.S. side. Letting the working group discussions drag on without clarifying which general direction he would have the talks go is not only disingenuous toward the Untied States, but it will also raise false hopes among the Japanese public. Hatoyama must recognize the power of his own message, and become a real force in resolving the issue. Amid the ever intensifying competition for survival, college cafeterias are undergoing major changes in an attempt to attract more students, with some offering a conveyor-belt fresh sushi bar or an open-air Italian restaurant. There are some 1,300 seats available at the food-court style cafeteria at Toyo University's Hakusan campus in Tokyo's Bunkyo Ward. Students can choose from a wide variety of options offered at six eateries. "We have either fried chicken or rice omelet here almost every day," said a first-year student. Indian curry with freshly baked naan bread is also popular among students at the college. The most recommended dish at the Nippon Institute of Technology in Saitama Prefecture is the "Minori Sushi" lunch. The combination of its toppings changes depending on the fresh fish available for each day. Other popular menu items include rice bowls topped with raw fish, available from between 500 and 650 yen. The college's sushi bar manager Hisao Yoneyama, 50, was headhunted by an official when he was working as an apprentice chef at a nearby sushi restaurant, and opened his own shop on campus in 1992. The University of Tokyo boasts a French restaurant that opened in 2004. The special of the day costs 800 yen, a price relatively high for college students, but "students visit the French restaurant when they want to spoil themselves with a special treat," according to a restaurant employee. Gakushuin University reformed the interior of its cafeterias two year ago, while outsourcing the operation to Seven and i Food Systems Co. There is a piano placed in the cafeteria of the women's college, allowing students to hold lunchtime piano concerts. Meanwhile, some universities are promoting unique initiatives focusing on the environmental and social issues at their cafeterias. Aoyama Gakuin University has started its "Table for Two" campaign this year. If students order one of the specials of the week priced at 480 yen, 20 yen will be donated to help children in developing countries. The campaign came about after negotiations between students and the cafeteria operator. "We've studied about the international contributions college students can make, so we have put that into practice," said a senior student. College cafeterias used to be considered a place for poor students; however, this does not hold true for universities today. Instead, cafeterias are playing a role as a special feature to attract new students to the university. "As the country's birth rate continues to decline, universities are required to attract the attention of prospective students. At the same time, the food-service sector is trying to survive the economic downturn by advancing into colleges," said a PR representative of a major preparatory school. Waseda University's Gakushoku Kenkyukai is a college club that researches cafeteria menus from universities across the country. Club representative Junichi Nakamura, 21, said that: "School cafeterias serve as a basis for college life. Students can find their friends there, and exchange information." Furthermore, students can stay at the cafeteria for as long as they want. "As many of the customers at school cafeterias are faculty members and neighboring residents, colleges can also expect advertising spin-offs from quality cafeterias," Nakamura said. Not only private schools and but also national universities that have transformed into independent administrative agencies hope to win students by adding value to their cafeterias. Taking appropriate measures to prevent the repeat of thefts and stimulant-related crimes is an important task when it comes to building a society in which people can live with peace of mind. This year's white paper on crime, which was released by the Justice Ministry recently, raises the theme of developing measures to prevent repeat offenses. The 2007 white paper also focused on repeat offenses, and since then the ratio of recidivists to the total number of perpetrators of crimes cleared by police or other investigative authorities has been increasing, hitting 42 percent last year. Taking effective measures to thwart recidivism holds the key to maintaining the country's public safety. The 2009 white paper on crime analyzed the current situation of theft and stimulant-related crimes, whose recidivism rates are particularly high. The analysis found that more than 70 percent of convicts serving prison terms for either of the crimes had previously been jailed for the same crime. The recidivism rate for these crimes is extremely high, compared with other crimes, proving that once people committed theft or stimulant-related crimes, they tend to reoffend. Shoplifting is the most common type of theft. "Lack of income to cover living expenses" was given as the top motive for committing this crime among both male and female offenders. The recidivism rate of perpetrators of theft who had a regular job, meanwhile, tended to be lower than that of part-time workers or unemployed people. It is vital that the Justice Ministry and Health, Labor and Welfare Ministry cooperate and enhance support for people discharged from prison to help them find a job at Hello Work employment service offices and other places. Though the economic situation is severe, it is indispensable to encourage employers to hire such people. The recidivism rate for stimulant-related crimes is also high among unemployed people. It should be noted, however, that the recidivism rate of those who are single and live alone is higher than that of those who are married and live with their family or other relatives even though they work full-time. To prevent repeat stimulant-related offenses, it seems necessary for the people they live with to keep a watchful eye on them. The role of parole officers, who regularly examine urine samples taken from those living alone and check their living situation, is even more important. The Justice Ministry is developing self-rehabilitation promotion centers that provide support for released prisoners, whose treatment is often difficult. But opposition from residents has held up plans to develop such centers. In addition to correctional education at prisons, the government should establish a system that would offer educational programs at those centers to teach people who served time in prison for stimulant-related crimes how to stop using stimulant drugs and help them reintegrate into society. As symbolized by arrests of TV celebrities, the widespread abuse of stimulant drugs is becoming a serious social problem. The Justice Ministry needs to appeal to the public the necessity of operating such centers and win their understanding. The administration of U.S. President Barack Obama's foreign policy is centered on a multilateral approach, a precondition of which is that the countries in each region should expect to play their part. The United States is essentially saying: "We respect you, so we would like you to take up some important tasks that will be in both our interests." This is a cool and realistic foreign policy, indicating that despite the U.S.'s superpower status it is dealing with other countries on an equal footing. In his Nov. 14 speech in Tokyo, Obama declared that "Our efforts in the Asia-Pacific will be rooted, in no small measure, through an enduring and revitalized alliance between the United States and Japan." But this was not just an affirmation of the bilateral relationship, but a call to Japan to take up greater responsibilities in the region. Japan has lent support to U.S. initiatives, dispatching Self-Defense Forces units to aid reconstruction in Iraq, refuel Western warships in the Indian Ocean involved in the Afghan war, and help defend international shipping against Somali pirates. However, in Japan's own backyard of East Asia, has Tokyo played a proactive role beyond supporting U.S. bases in Japan? The U.S. bases in Okinawa are essential parts of American strategy in the region, especially as North Korea continues its nuclear weapons development and China boosts its military strength. Thus, Japan must see the Futenma base relocation issue in the context of policy towards all of Asia, including China and North Korea. Realistic alternatives to the U.S. military presence in Okinawa are not just hard to imagine, but building a foreign policy around moving those bases out of the prefecture or out of Japan should be reconsidered. On Oct. 14, Political News Department reporter Nakae Ueno argued in this column that Futenma was not just a foreign relations issue, but also a symbol of regime change, and called on the government to take the negotiations with the U.S. slowly and take the popular will of Okinawans into account. On Nov. 10, Naha Bureau reporter Teruhisa Mimori wrote that the will of the Okinawan people is plain to see, and called on the government to do its utmost to move Futenma out of the prefecture. I must respectfully disagree with my colleagues. There is also a proposal to merge Futenma with Kadena Air Base. However, Kadena is the largest U.S. Air Force base in Asia, and is aimed squarely at countering Chinese air and naval power. If, as the Americans insist, merging Futenma with Kadena -- itself entwined with Japan's Asian policy and the security guarantee -- would reduce the air base's operational effectiveness, then the Japanese government would do best not to approve such a move. As for getting out from under the American shadow and building an Asian policy of our own, if we judge that the U.S. guarantee of Japan's security is still necessary, that includes not turning the excessive cost of such ambitions back onto the United States. During the last election, Prime Minister Yukio Hatoyama called on Futenma to be moved out of Okinawa Prefecture. However, the base issue should not be distorted into a purely domestic issue. The prime minister must accept the criticism and recant his statements on Futenma. Japan has a strong tendency to view the Japan-U.S. security guarantee as a purely bilateral issue, not as a guarantee actively aimed at securing all of East Asia. As a rule, the Japan-U.S. alliance has always come first, and as a result Japan is not truly viewed as a member of Asia. The government has excluded the Self-Defense Forces from a special measures law to inspect North Korean ships. However, to prevent the diffusion of North Korean weapons of mass destruction, the government may yet be faced with having to deploy Japanese forces. Hanging over the government's hesitation to make practical use of the Self-Defense Forces is the sense that it is skirting around the issue of Japan's relationship with Asia. When at the APEC summit in Singapore, Hatoyama stated that "reconciliation in the real sense of the word is not necessarily believed to have been achieved in the region ... although more than 60 years have passed since Japan caused tremendous damage and suffering to the people of many countries, particularly to the people of Asian nations," he was also speaking to himself. Is the new administration's stance on science and technology about to be called into question due to its budget measures? In its review of ministerial budget requests for fiscal 2010, which is aimed at cutting wasteful spending, the Government Revitalization Unit has decided to "effectively freeze" a project by the Education, Science and Technology Ministry to develop a next-generation supercomputer. The supercomputer would be used for science and technology research. The world's leading supercomputers can make calculations one million times faster than a standard personal computer. They have more than 1,000 central processing units--the brains of a computer--as well as other components that allow for higher computing speed. Most supercomputers are huge and due to the heat they generate while making calculations need to be installed in a large, well air-conditioned room. The machines are used for simulations in a wide variety of fields, including climate-change prediction, aircraft design and genetic research. They are indispensable to those who need to conduct tests in fields where practical experiments are nearly impossible to do and they cut the time it takes to carry out research, thereby keeping research costs down. In light of these important roles, there is a fierce global competition to develop supercomputers and the Japanese project is going up against the world's best. Does the government intend to undermine advancement in key research areas? Currently, the United States is leading the race to develop supercomputers that are even better than the world's leading models, which have reached speeds of about 1 quadrillion calculations per second. Japan's next-generation supercomputers aim at improving this calculation performance by the power of one. Such an improvement would see the period taken to develop an aircraft, in simple terms of calculation, lowered to a 10th of the time it currently takes. That would bring huge benefits. However, it is not easy to improve performance by the power of one over what are already cutting-edge machines. To that end, it is necessary to develop improved circuitry, including better semiconductors, a basic part of every computer. The private sector cannot take on such a massive task alone. The United States and other countries develop supercomputers with financial backing from their governments. Japan also included about 27 billion yen for this purpose in the fiscal 2010 budget requests. During scrutiny of the budget request relating to the supercomputer project, government panel members made comments such as, "Is it really necessary to aim for first place [in this field]?" or "It's better to purchase such equipment from abroad." But these observations of the current situation are both poorly expressed and inaccurate. Unless Japan makes an effort to take the lead in supercomputer development, it will not rank with the superpowers in the field. Japan ranked first in the world in terms of supercomputer calculation speed in 2002, but lost the top spot 2-1/2 years later. Today, it languishes in 31st place, behind even China and South Korea. Buying a supercomputer from abroad can prove very difficult because nations closely guard the secrets behind their state-of-the-art technology. Japan would be reduced to purchasing only midranking supercomputers in terms of processing capacity. If researchers cannot use cutting-edge supercomputers in Japan, it could lead to a brain drain of capable researchers. An overseas report has already appeared in which it was said that Japan's science and technology spheres would fall into decline if the supercomputer project was frozen. Budget requests for other science and technology-related projects also were severely scrutinized. It is natural to want to cut wasteful spending in the budget requests, but we do not want to see a situation emerge in which Japan's science and technology lifeline also is cut. Tatsuya Ichihashi, who spent two years, seven months on the run from police after fleeing from his apartment where the body of Briton Lindsay Ann Hawker was found, reportedly showed no resistance when police apprehended him at a ferry terminal in Osaka this month. Ichihashi was raised in a privileged family, and while he was unable to become a doctor like his parents, he continued to study at university. He failed to find a job right away, but he was said to be searching for his dream while receiving financial support. One could say he was a youth who symbolized an affluent society; he was far removed from the young victims of social disparity such as those who lose their jobs due to company layoffs of temp workers. So how did Ichihashi end up living in hiding for such a long time without (as far as we know) receiving any assistance? Where did his obsession with escaping at all costs come from? Of course we don't yet know all the details of the case, but Ichihashi was said to have told people at a construction company where he worked that he had shut himself off from society. Perhaps what he said was not altogether made up. It is possible that he had tried to enter the medical profession like his parents but failed to do so, and during his days as a student when he was asking, "What do I want to do? What do I want to become?" his mental state corresponded to withdrawal from society -- regardless of how much fun he looked like he was having. Ironically, running away from police forced Ichihashi to think by himself and make his own decisions. In a sense, those days on the run when all responsibility fell on him possibly gave him a sense of being alive. In my clinic, young people often arrive saying that they don't feel they are living of their own accord, even though they are in fortunate circumstances. They, too, choose the path that will please the adults around them for the time being, without really knowing what they want to do, and live each day without any challenges. One young person told me, "I want to experience living of my own free will, not because somebody has asked me to do something." But it is difficult to seize that opportunity. Saying this, however, there are young people who go on to live independently after taking part in volunteer or disaster relief activities. I have often seen people who have lived withdrawn from society for more than a decade change suddenly and become active in this way. All young people have underlying strengths. The scene that unfolded early Friday at the Diet was all too reminiscent of the era under Liberal Democratic Party rule. The three-party ruling coalition led by the Democratic Party of Japan steamrolled a debt relief bill for small and midsized companies and housing loan borrowers through the Lower House. The bill encourages financial institutions to ease repayment terms for struggling customers. Earlier, the ruling coalition, which also includes the Social Democratic Party and the People's New Party, forced the bill through the Lower House Committee on Financial Affairs after only eight hours of deliberations over two days. Thus, the ruling camp threw away a good opportunity to debate the role of the nation's financial sector in the recession. With the year-end surge in corporate demand for funds looming, the government and the ruling bloc apparently wanted to enact the bill as quickly as possible. But they deserve to be criticized for acting so hastily. The ruling coalition explained that time was of the essence since other important bills need to be enacted before the current Diet session ends on Nov. 30. No doubt, the LDP and the other opposition parties tried to draw out the Diet deliberations. But that doesn't justify treating the process of Diet deliberations lightly. The opposition bloc is toughening its stance. Does the DPJ intend to continue steamrolling bills through the Diet while the opposition parties boycott the sessions and votes? Following the first genuine power transfer in postwar Japan, the nation's political system is undergoing a radical change, for example, by putting politicians in charge of policymaking instead of bureaucrats. This has raised expectations for a significant change in the way the Diet operates. In fact, Prime Minister Yukio Hatoyama's policy speech struck us as refreshing when he spoke about his political philosophy in his own words. Often during committee sessions, both opposition questioners and the prime minister and his Cabinet members engaged in lively debate without depending on memos prepared by bureaucrats. Consequently, the forced passage of the bill seemed like a return to the old Diet, where center stage was often taken by partisan political dickering over the schedule, rather than the content of debate. The move by the ruling camp put a damper on expectations for more vibrant and meaningful discussions at the Diet. As it is, plans for a one-on-one debate between the party leaders remain on hold. Ichiro Ozawa, the DPJ's secretary-general, has been the main champion of Diet reform. He has called for a departure from such parliamentary traditions as getting bureaucrats to answer questions and wasting time on partisan negotiations on the schedule. That would allow politicians to engage in serious debate. The DPJ should try to figure out a new approach to managing Diet affairs in line with Ozawa's argument. Among the bills waiting to be considered is one to freeze the planned sales of government-held shares in Japan Post Holdings Co. and its affiliates. The bill, which embodies the Hatoyama administration's pledge to review the process of postal privatization, demands especially exhaustive examination. The ruling coalition must not rush to enact the legislation by resorting to its majority in the chamber. The government is opposed to an extension of the Diet session because it fears it would hamper work to draft the budget for next fiscal year in December. But it should consider a limited extension to ensure sufficient discussions are held on these important bills. Some of the members of a group of opinion leaders have put together a set of proposals for Diet reform in response to Ozawa's request. They include making the Diet open throughout the year so lawmakers can consider bills without worrying about time limits. Now, bipartisan debate should start on Diet reform toward the next year's regular session. The ruling camp's dependence on its majority to push through its political agenda is not in tune with the new era, as symbolized by the regime change. As of early October, nearly 40 percent of university seniors seeking jobs after they graduate in March had no offers of employment, according to a government survey. The percentage of those who secured job offers dropped nearly to the level of 2003, the peak of extreme job scarcity dubbed the "employment ice age." Companies that have reduced the number of new hires have apparently become more selective amid the uncertain economic outlook. The situation is also serious for students who will graduate from high school. From around 1995 to 2005, companies curbed their recruitment of new graduates as regular employees and replaced them with nonregular workers. Young people who could not land permanent jobs on graduation had no choice but to continue to work as dispatch workers or so-called freeters without acquiring skills. Since their income is unstable, such workers are hesitant to get married or start a family. Seriously hit by the financial crisis that started last year, many people lost their jobs and homes at the same time. How to support these young people of "the lost generation" has become a weighty social problem. To prevent a recurrence of the situation, the government should do whatever it can to support job-seeking students toward next spring. The government's task force for emergency job measures has taken action for would-be graduates and is calling on business organizations to expand employment. However, companies are also crying for help, saying they already face difficulties maintaining current payrolls. But there must be industries suffering from a labor shortage as well as medium-sized and small businesses that are eager to hire. Perhaps this is a chance for students to look at new areas of growth potential rather than seeking stable employment at major companies. Hello Work public job placement offices, universities and other schools should tie up to find job offers in local communities and create more opportunities to bring employers and students together. There is another problem that must be addressed on a long-term basis. It is the corporate practice of hiring new graduates en masse only once a year in spring. We wonder if the practice will remain effective. This hiring practice only worked when the economy grew steadily and companies trained workers under the lifetime employment system. Now, each time the economy slumps, many regular workers lose their jobs, which increases instability in the labor market. We are now in an age in which diversified talent is sought. However, under the current hiring practice, job-seeking students and prospective employers have only one opportunity to meet, upon the students' graduation. Mid-career and year-round hiring should be expanded so that students who graduated earlier can repeatedly apply for regular positions. A system is also needed to help young unemployed people acquire skills and techniques so that they can continue to apply for jobs. During economic downturns, the practice of hiring new graduates en masse causes a serious distortion in university education. Companies are moving up the timing of recruitment to secure competent students. This has caused anxious students to scurry and attend job-briefing sessions and interviews, which eats away the time of students who should be devoted to learning. If such activities undermine students' potential as competent workers, it would be tantamount to putting the cart before the horse. YERBA BUENA ISLAND, Calif. - Never has steelwork seemed so entertaining. 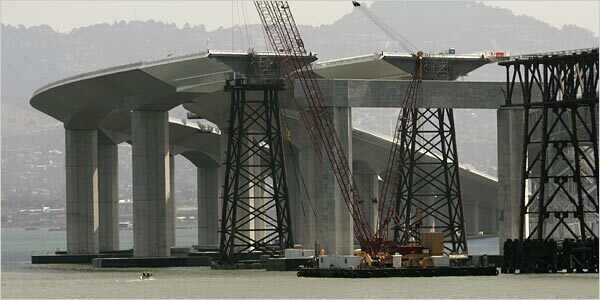 Since Thursday night, when the traffic stopped and the blowtorching began, the attention of many in the Bay Area has been firmly focused on a huge construction project under way on the San Francisco-Oakland Bay Bridge, which connects the two cities via this tiny, picturesque dollop of an island. The project has drawn interest not only because of its complexity, but also because it has resulted in the first weekday closing of the bridge since the 1989 Loma Prieta earthquake, which caused a section of the bridge’s eastern span to collapse and prompted the seismic upgrade of which the work this weekend is a part. So it is that residents, reporters and retrofitting fans have been watching online and from afar as a swarming construction crew has slowly ? oh, so slowly ? worked to cut loose and replace an old 300-foot span of the bridge that connects the eastern span to a tunnel on Yerba Buena. In its place will be a temporary bridge serving as a detour around the old piece, which will be demolished to make way for a new seismically correct piece. That piece will eventually be connected to two sleek, curving, side-by-side decks that will lead to and from Oakland, all by late 2013. Or at least that is the plan. The cost of the complete bridge retrofit has ballooned to more than $6 billion over the years, and there have been several delays. On Friday afternoon, workers found themselves again falling behind schedule when the old piece of bridge, which dates to its opening in 1936, proved to be more stubborn than expected. And like anything that old and sedentary, there is more than a little groaning, with the bridge letting off a few loud metallic moans, which occasionally alarmed a few members of the press corps standing under the bridge’s ample shadow. But Mr. Ney reassured reporters that those sounds were normal for a bridge its age. By dusk Friday, crews had begun shifting the old piece of bridge out, inching it along lubricated skids. And as exciting as that sounds, it was not. One churlish member of the press likened it to watching paint dry, which, of course, was also happening on other parts of the bridge. Indeed, with traffic suspended, officials from several agencies took the opportunity to spruce up the Bay Bridge, which has long labored in the shadow of the showier Golden Gate Bridge, which connects San Francisco to Marin County. Potholes were filled, light bulbs changed and lanes on both levels of the double-decker bridge touched up. Firefighters, meanwhile, used the closing as a chance to practice rescues, with crews seen headed up the suspension cables on the bridge’s western span Friday afternoon. And while local subway trains seemed more crowded than usual on Thursday night, there were few problems reported with the Friday commute, possibly because of people fleeing early for the Labor Day weekend. Despite the Friday afternoon snag, officials said crews expected to finish their work by early Tuesday or ahead of schedule, as they did with a similar closing in 2007.